Imagine Managed SD WAN as a head coach. Without a leader, existing network deployments are just a collection of players. They perform well individually, but may not integrate harmoniously. That’s where your network coach, Managed SD WAN, can help. Free up your internal team and let our experts go to work. We provide comprehensive network management and monitoring. We’ll help you prioritize your WAN traffic and create software defined WAN policies, rather than just increase your bandwidth. With SD policies, you’ll use bandwidth more efficiently, helping you avoid unnecessary upgrades. Using polices specific to your WAN and business needs, our app-aware routing will steer traffic as needed, according to app performance demands. This dynamic process saves you time and resources. As conditions on the network change, we can route traffic as needed, automatically prioritizing critical applications while dynamically suppressing non-critical ones. Depending on your current infrastructure, our Managed SD WAN can seamlessly overlay your existing WAN technology. We’ll change how your WAN works without drastically changing your network. That means you get all of the benefits of software defined WAN, without an overall “rip-and-replace” approach to your investments. Your equipment doesn’t become obsolete, but its inefficiency does. Our experts quickly handle upgrades, changes, wireless and third-party connectivity verification, and other complex issues and our Managed SD WAN services are backed by comprehensive SLAs. So we manage your network, while you manage your business. TelcoLynx can help you leverage your existing bandwidth more efficiently. MPLS networks can be expensive and inefficient, especially if business is using SaaS applications and 70 to 90 percent of your private network traffic is internet-bound. 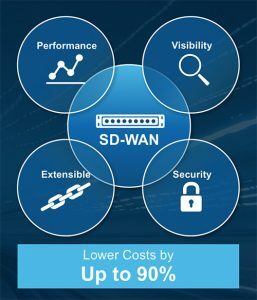 SD-WAN also allow businesses to be carrier and transport agnostic leveraging broadband or Ethernet with 4G LTE combined, which provides a solid backup solution. Like many, you may already use one or both of these options in a hybrid environment, but you still need better performance from your hybrid network. Managed SD WAN uses application-aware routing to automatically allocate traffic in your hybrid network. We can bring your public and private networks together and dynamically adapt them to evolving bandwidth and app performance needs, so your WAN can respond faster to rapidly changing business demands.